Hundreds, if not more, of research papers have been published about lithium batteries, as well as numerous books. Still, a lot of this material is not very applicable to lithium batteries on board marine vessels and can be misleading: the type of application and usage considered are too different, the chemistry is not the same… the reasons are numerous. Some of this research is very relevant however. I lost track long ago of the number of publications I read or studied about lithium batteries in the process of designing and building such systems. One of the best books available on the subject at present is Design and Analysis of Large Lithium-Ion Battery Systems . This article is an attempt at synthetizing the most essential fundamental information about lithium battery cells for those wanting to use them to build marine house banks. This material is essential to read and understand if you are seriously thinking about changing over to a lithium bank: lithium batteries are very, very different from traditional lead-acid ones. It is not just a matter of swapping. Firstly, to clarify the terminology, lithium-ion refers to a family of battery chemistries, not a specific type of battery. There are numerous types of lithium-ion batteries, each with its strong points and weaknesses. Their common feature is just that Li+ ions act as charge carriers. Lithium Iron Phosphate (LiFePO4, sometimes also referred to as LFP) is by far the most robust type of lithium battery developed so far. The other types of lithium-ion batteries are mostly completely unsuitable and unadvisable for use on board a yacht. They share a lot of the same characteristics, but not their safety and stability; they would not represent a sensible, safe choice on board at all. As a result, the information presented here specifically applies to lithium iron phosphate cells and battery banks. What is a LiFePO4 Battery Cell? Before discussing the “do and don’t” aspects of LiFePO4 batteries, developing a basic grasp of their construction and chemistry is very useful. Somehow, we tend not to overlook so readily what we understand. In the case of lithium batteries, cutting corners is not an option. 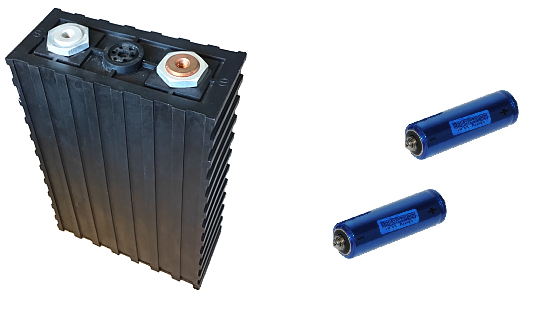 Similarly to a lead-acid cell, a LiFePO4 battery cell is formed of positive plates (cathode), negative plates (anode), porous insulating separators preventing them from shorting out, and a conductive liquid (electrolyte) surrounding them. The differences reside in the materials used and the fact that a lead-acid battery operates through chemical reactions transforming its components, whereas a lithium battery just relocates lithium ions during charge and discharge, leaving everything else in the battery largely unaltered. By definition, the anode of a device is the side where current flows in; the cathode is where it flows out. For this reason, the positive terminal of a battery is the cathode. This can feel counter-intuitive at first, because the anode of a diode is on the positive side. The anode of a LiFePO4 cell is made of a highly conductive copper sheet coated with porous graphite. The cathode is made of aluminium coated with lithium iron phosphate material, a kind of ceramic. The specific capacity of lithium iron phosphate material is about 140mAh per gram, so a 100Ah cell needs a little over 0.7kg of active material in its cathode. Internal structure of a lithium iron phosphate battery cell in a partly-charged state. In order to create a battery, a conductive electrolyte must be provided to permit the transfer of charges between the anode and the cathode. The electrolyte is formed of a lithium salt (lithium hexafluorophosphate, LiPF6 typically) dissolved into an organic solvent: some combination of ethylene carbonate, dimethyl carbonate, propylene carbonate with various other additives. This solvent is very flammable and fully absorbed into the porous plates and separator. Unlike in a flooded lead-acid cell, there isn’t free liquid in a LiFePO4 cell. A battery in the state described above is fully discharged, with all of the lithium present into the cathode and the electrolyte. This corresponds to a newly manufactured cell. The manufacturer then performs formation cycles to obtain a cell that can be subsequently used and will last. The formation cycles control the initial development of the Solid/Electrolyte Interface (SEI) layers at the surface of the plates. The SEI layer originates from chemical reactions between the electrolyte and the electrodes; it stabilises the cell chemically, but also keeps growing gradually over time, until it becomes detrimental to its operation. An important notion is that the SEI layer grows a lot more rapidly over time at elevated temperatures. Protecting lithium cells from heat is essential in terms of achieving a long life. The objective should be trying to keep them around some 15-25°C (59-77°F) as much as possible. Cells can be built by stacking parallel plates, as illustrated above, or from single long strips rolled onto themselves into a cylinder or flattened cylinder. The former are referred to as prismatic (box-shaped) cells, the latter are cylindrical or wound cells. Their chemistry is exactly the same, the main difference resides in their construction and ability to dissipate internally generated heat and to some extent cost. Prismatic cells are sometimes encapsulated into soft synthetic pouches instead of a hard casing, but pouch cells are a lot more fragile mechanically and more problematic to work with. Prismatic cells come in much larger sizes than small cylindrical ones. Batteries are sometimes internally assembled from a large number of small cylindrical cells. Wound cells, and small cylindrical cells in particular, are cheaper to manufacture than the larger prismatic ones for a given capacity. They also have a higher volumetric energy density, but their round cross-section prevents from packing them together without gaps and this advantage doesn’t extend to the assembled battery. The gaps between the cells can present an advantage for cooling when thermal management is necessary due to very high currents, but, in marine applications, the currents are modest and the battery cells never seem to get more than a few degrees above ambient temperature. Mechanically, cylindrical cells are very robust and very resilient to mechanical damage from shocks and vibrations, which is good in electric vehicles. Prismatic cells seem to age better and offer more cycles in operation than small cylindrical cells, but this may be specific to high-current usage profiles. Marine lithium battery systems are normally built from prismatic cells, for practical reasons first and foremost: they are much easier to interconnect than an extremely large number of small cylindrical cells. When the battery is charged, the lithium leaves the cathode, migrates through the electrolyte and into the anode to form LiC6 as the lithium inserts itself within the graphite matrix; in the same time, the LiFePO4 cathode progressively turns into iron phosphate FePO4 only. Conversely, discharge depletes the graphite anode and re-inserts the lithium into the iron phosphate crystalline structure of the cathode. Migration of the lithium ions in a lithium iron phosphate cell throughout charge and discharge. The insertion of lithium ions into either material is called intercalation. Both the graphite and the iron phosphate materials are very stable structurally, with or without the presence of lithium in them, which is why these batteries can be so durable. They don’t structurally suffer from the lithium intercalation and de-intercalation process, and by extension they are largely immune to cycling. When the lithium salt is initially dissolved into the electrolyte, it naturally breaks up into lithium ions Li+ and hexafluorophosphate ions PF6–. Near the end of the charge, the cathode runs out of lithium, the amount of free lithium ions in the electrolyte reduces rapidly and the cell voltage begins to rise very fast. The electrodes also becomes a lot more reactive chemically with regard to the electrolyte: this latter phenomenon is harmful to the cell and the longer this condition persists, the more internal degradation it causes. A high ambient temperature further accelerates it. Electrolyte composition and additives are the main points of differentiation between manufacturers; additives have a huge bearing not only on cell performance, but also on eventual life expectancy, because they alter the way capacity fades over time by controlling the growth rate of the SEI layer. Excessive charge rates. If the charge rate exceeds the cathode’s rate of absorption for lithium ions, lithium metal is instead deposited onto the surface of the electrode. Most manufacturers recommend operating the cells at or below 0.3C in spite of much higher charge rates being readily achievable. Cold temperature charging. Temperatures close to or below freezing dramatically reduce the absorption rate of lithium ions into the graphite cathode, because lithium insertion becomes more difficult. In other words, charge rates that are acceptable at normal ambient temperatures become excessive in cold conditions. Trickle charging. 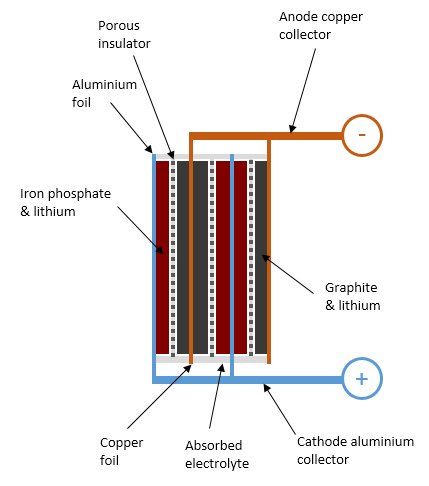 Trickle charging causes all of the lithium present in the cells to be transferred to the positive electrode, whether it can be normally inserted into the carbon cathode or not. Any lithium that cannot be absorbed normally ends up plating the cathode. From the above, it should be obvious that an operating regime combining fast charges followed by a trickle charging is particularly harmful. A fast charge tends to saturate the anode surface with lithium ions and then any additional charging results in lithium plating. This scenario can quite easily be met on marine installations where a focus was placed on fast recharging through the use of an engine and alternators (or high-capacity DC chargers) and renewable energy systems then fail to properly implement a charge termination and hold the cell voltages up. Safety is an important topic in the context of lithium batteries, for the simple reason that they are capable of igniting violently and burning extremely hot and can be problematic to extinguish. There are many, many types of lithium-ion chemistries on the market, with more coming undoubtedly. So far, only one is truly eligible for installation on boats, and even more so for building DIY systems, because of its much higher ignition temperature: lithium iron phosphate (LiFePO4). LiFePO4 cells are incredibly stable and robust chemically compared to the other variants and they are also manufactured in sizes that are practical for assembling house banks. This primarily translates into a battery cell that is exceedingly difficult (but not impossible) to ignite. Considering the explosive gases produced by lead-acid cells when charging and the risks associated with them, LiFePO4 cells should probably be seen as significantly safer in comparison, but they are lacking the long track record of lead-acid chemistry. A marine engineer I know once went down into the engine room of a fishing boat that wouldn’t start. Flat battery was deemed to be the culprit. He and the owner brought along a spare fully-charged battery and heavy-duty jumper leads. 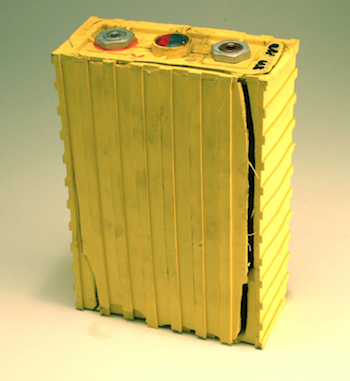 The starting bank was made of two regular 12V lead-acid batteries. A strong spark was observed when they connected their new battery in parallel. They saw it as a confirmation that the bank was really flat. Before they could even try and crank the engine, their battery exploded, showering them in debris and acid within the confined space of the engine room. They barely made their way out, blinded by the acid burning their eyes. The engine starting system was in fact 24V, the two batteries were in series and there wasn’t much wrong with them either. They discharged heavily into the single 12V battery, causing an intense release of highly explosive oxygen and hydrogen until something triggered ignition. In order to reach thermal runaway and a battery fire with LiFePO4 chemistry, the oxygen held within the iron phosphate material needs to be released. Unlike with other lithium compositions, this is extremely difficult to achieve and requires very high temperatures to be reached. There have been many instances of inadequately installed LiFePO4 cells that overheated and caused great concerns about a possible fire, but none that actually ignited and burned yet on marine vessels – as far as I am aware of, at the time of writing. The fact that the technology is actually remarkably forgiving should not be an incentive for taking more risks or abusing it, but this point has already been lost by a few and a serious incident with a marine installation may well be around the corner, just like some DIY electric vehicles caught fire in the past. The photograph above should be seen as a sobering reminder of what can happen, even with lithium iron phosphate chemistry. In this instance, the charging regime was well into over-voltage territory and the system lacked some of the most basic protection features. 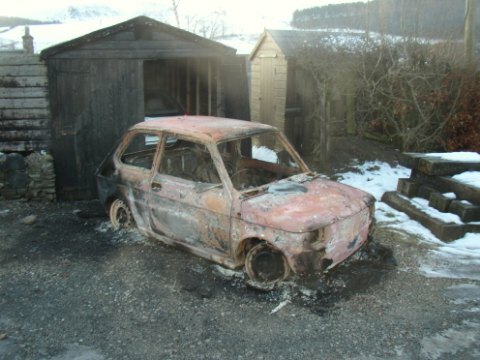 Ignition took place during recharging and the car burned with such intensity that glass and aluminium melted and pooled on the ground underneath the vehicle. The only notable fuel present in this purely electric car was the lithium iron phosphate batteries… Needless to say, there wasn’t enough left to be too specific about the definite root cause of the fire and such an event on board a yacht would write it off. LiFePO4 cells can provide extraordinary performance and service on board marine vessels, but unlike some of their proponents like to claim, abusing them always causes irreversible damage and their safety can become severely compromised afterwards. This Winston cell built up pressure until the casing exploded. Catastrophic failures of LiFePO4 cells are near-invariably associated with recharging and result from over-charging and excessive voltages. These failures are normally limited to the destruction of the cells. If the cell voltage rises to 4.3V or above, the electrolyte is chemically decomposed into gaseous products that pressurise the sealed casing of the cell. If the pressure build-up is sufficient, it can cause the swollen cell to vent these gases. In some instances, cell casings ruptured violently. The gases, once released, are highly flammable, but they don’t spontaneously ignite; most of the time, they just dissipate. Should they get ignited, they would cause some kind of gas explosion external to the cells by combining with atmospheric oxygen. Some robust form of entertainment would certainly be provided, but a battery fire would still be most unlikely. One should however note that, should the LiPF6 salt present in the vented electrolyte find moisture to react with, hydrogen fluoride (HF) can form. This gas is fluid enough to pass through the skin, extremely corrosive and a known carcinogen. When enough current is involved to severely overheat the cell, the electrolyte can boil off and also vent out of the cell. In each case, the root cause can normally be traced back to a charge regulation failure with an absence of overcharge protection and an absence of temperature sensing. A friend who had simply dropped 200Ah of LiFePO4 batteries in his cruising yacht a few months earlier, following advice from the battery dealer who posed as an “expert”, faced an alternator fault. Twenty minutes after leaving the marina under power, standing alone in the cockpit, he noticed a most abnormal smell coming from down-below. The cabin was filled with mist and the air was almost unbreathable. He killed the engine immediately. Lifting the lid of the battery compartment, an intense heat was coming off the destroyed bank. Two out of the four cells had swollen completely out of shape. The heat was such that he feared a fire would break out any minute and he notified the local Coastguard of the situation. Several nearby vessels, including a 450-tonne passenger ferry, came to stand by until a police patrol vessel took the yacht in tow. The cells took several hours to cool down to the point where they were no longer too hot to be touched. In order to discover the root cause of the incident, the engine was later restarted at idle. The voltmeter read 17.5V at idle: the alternator had failed and was no longer regulating. Had the problem gone unnoticed a little longer, there is very little doubt that the bank would have eventually caught fire with the full output of the alternator getting dumped into it continuously. If the elements in the cell are heated above some 200°C (for LiFePO4 cells only, other chemistries have a lower value), the oxygen bound within the iron phosphate material of the cathode gets released. This is extremely dangerous, because this free oxygen then recombines with other elements inside the cell (like carbon) acting as “fuel”; this suddenly causes much more heat to be released and thermal runaway quickly follows. At this point, combustion has become the dominant source of heat, the cell bursts into flames and an extremely hot fire quickly propagates to neighbouring cells. While this scenario can be difficult to reach on a yacht, some installations on multihulls can feature solar arrays in excess of 1kW, other vessels are equipped with large alternators or shore power chargers, and such systems certainly have the capability of overheating a bank to ignition point, should something seriously malfunction without an independent protection mechanism to act as a line of defence. The other failure mechanism is by internal fault developing within the cell; in other words, the cell shorts internally. This seems to be the rarest of occurrences to say the least (I am not aware of a single instance that resulted in significant consequences with prismatic LiFePO4 cells) and it should be noted that the same can just as well happen to a lead-acid cell and those have a tendency to explode then. There is little actual data available to indicate what happens next, but it is worth noting that driving a nail through a cell for example and thus causing it to short-circuit internally is enough to cause it to heat up and vent profusely, but not sufficient to cause ignition. Most other lithium chemistries spontaneously ignite in the same circumstances because, as described just earlier, the bonded oxygen gets released by thermal decomposition, but at much lower temperature. This is the main reason for not considering any other lithium chemistry than LiFePO4 for on-board electricity storage. There is one well-known pathway promoting internal cell failure: excessive discharge. If a LiFePO4 cell is discharged below 2.0V, at some point its polarity suddenly reverses and the anode copper substrate starts dissolving into the electrolyte. Upon recharging, this highly conductive copper gets precipitated out of the electrolyte and deposited onto the cathode surface where it forms dendrites, or crystals with very sharp features. These copper dendrites are at risk of piercing the thin insulating separator between anode and cathode and short-circuit the cell . The first consequence of dendrite formation is increased self-discharge through internal micro short-circuits; those also induce cell heating during recharging. A cell that has faced such treatment can potentially fail at any time afterwards and there is no assurance any more that it might fail “nicely”. The root cause goes back to an absence of automatic over-discharge protection. When several cells are connected in series to form a higher voltage string, if a single cell in the string gets fully discharged and cannot contribute any current any more, it then only acts as a resistor while the remaining cells keep powering the circuit, forcing current through it backwards, from anode to cathode. This type of event is disastrous for the cell and has been the #1 mechanism that resulted in fires and many more near-misses on electric vehicles being recharged afterwards. The root cause is a lack of protection at cell level once again. Monitoring overall battery voltage is not good enough. 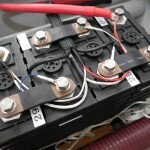 Electric vehicles are much higher voltage systems, where dozens of cells can be connected in series; this makes it much more difficult to ensure no cell ever get into over-discharge territory, because a flat cell doesn’t show as much in terms of overall pack voltage and individually monitoring that many cells has been more difficult technically, especially in DIY systems. Specialised integrated circuits have now become available to facilitate such a task, but their integration into a system is a non-trivial task at DIY level. In conclusion, don’t ever overcharge lithium cells and never, ever take them into over-discharge territory. A cell which has suffered a complete voltage collapse or polarity inversion is only good to be discarded immediately, even though it could appear that it can be somewhat recharged. Don’t try, don’t risk it. The same applies to swollen, overcharged cells. Some have been irresponsible enough to crush them back flat in a press and return them to service, calling this “recovery process”, taking an unlimited risk for the sake of saving a few hundred dollars after screwing up in the first place. Don’t operate damaged or “recovered” lithium cells on board either, ever. Mechanical damage (crush or penetration) that occurs at electrode edges is significantly more likely to cause cell thermal runaway than damage perpendicular to electrode surfaces. This was demonstrated in specific tests in which the narrow edges of the cells were mechanically challenged, rather than their main faces. The explanation is simple and logical: damage at the edges of the plates tends to lead to folding-over of the electrodes, with significant risks of heavy short-circuit; compression or punctures perpendicular to the plate separators results in much more benign damage in comparison. I am only aware of one instance where marine lithium batteries may have failed following mechanical damage on a yacht: the crash of the Volvo 70 racer Team Vestas Wind on offshore coral reefs in the Indian Ocean in 2014. The investigation report only contains two very succinct mentions of the Mastervolt lithium battery packs present on board, one to indicate that the batteries started venting following the accident and were transported to a nearby beach, and the second to mention that they were later found to have burned themselves out. The document blames the failure on immersion in seawater, but a simple calculation based on the conductivity of sea water shows that this would only result in discharge currents of a few amps. Water ingress within the cells is also unlikely due to their sealed nature, the lack of water pressure and the fact that the relief valve is designed to open on internal over-pressure. A tentative explanation is that the shock from the sudden impact at high speed caused the elements within the cell casings to shift, bruising the edges of the plates and creating a short-circuit. The cells themselves were of standard 180Ah/3.2V LiFePO4 prismatic construction. If the violent impact indeed caused them to short-circuit internally, then it illustrates the foolishness of using large format LFP cells for building marine house banks as some have already done, sometimes resorting to 400Ah or even 700Ah individual units. It would also greatly strengthen the case for mechanically clamping the cells together. As already developed earlier, thermal runaway is a chemical reaction that follows dissociation of the oxygen contained in the cathode material. This reaction requires heat: overcharging in itself is enough to destroy cells, but not sufficient to set a lithium battery on fire. The amount of current and duration involved must to be sufficient to raise the internal temperature before thermal runaway can occur. This is why high-powered charging sources such as alternators and – worse – shore power chargers can represent significant potential hazards when no reliable, effective and independent automated trip mechanism is implemented. “At a critical temperature, a chain of exothermic reactions can be triggered. The reactions lead to a further temperature increase, which in turn accelerates the reaction kinetics. This catastrophic self-accelerated degradation of the Li-ion battery is called thermal runaway. LCO/NMC, a blend of lithium cobalt dioxide and lithium nickel manganese cobalt dioxide: LiCoO2 / Li(Ni0.50Mn0.25Co0.25)O2. This chemistry is an attempt at taming the violent nature of lithium cobalt dioxide alone and the cells were rated at 2.6Ah at an average voltage of 3.8V, with a mass of 44.3 grams. NMC, lithium nickel manganese cobalt dioxide: Li(Ni0.45Mn0.45Co0.10)O2. The cells had a capacity of 1.5Ah, an average voltage of 3.8V and a mass of 43.0 grams. LFP, lithium iron phosphate: LiFePO4. The cell capacity was 1.1Ah at an average voltage of 3.3V and its mass was 38.8 grams. The gives LFP the lowest power density with 1.1Ah x 3.3V = 3.63Wh. LCO/NMC and NMC respectively deliver 9.88Wh and 5.7Wh, or 272% and 157% of the value of LFP for the same geometric volume. The calculation can be continued to include the mass of the cells, in which case LFP comes out a little better off due to its lighter weight, but still remains in last position. This alone explains why some applications stray from the safest, most robust option represented by lithium iron phosphate. The now famous failure of a lithium cobalt dioxide backup battery on board a Boeing 787 Dreamliner comes to mind, together with questions as to why we should accept such elevated risks for the sake of saving a few kilograms on an aircraft. In the case of marine batteries, it simply makes no sense, and even more so for DIY systems where design and installation errors can occur. Thermal runaway and temperature readings for three different lithium battery chemistries.The red curves relate to lithium iron phosphate cells under fast (1) and slow (2) heating rates. Ignition always occurs around 200°C. Lithium iron phosphate cells required the highest temperature to ignite, burned more gradually and reached much lower temperatures than the other types. The sharp increase in heating rate indicates the onset of thermal runaway. With an ignition temperature of about 200°C, lithium iron phosphate batteries (in red) are more difficult to set on fire and then don’t heat up as violently than other types. While the Lithium-Cobalt cell reached a rate of 400°C per second while bursting into a fire ball, its LFP equivalent only recorded a rate 8°C per second. Venting behaviour of various lithium battery chemistries. Unlike the other samples tested, which gased suddenly and violently, lithium iron phosphate cells (red curve) begin to release gases very gradually until reaching a steady rate. The graph clearly highlights the lack of initial explosion in the case of the LFP cell, but also shows that combustion is still on-going after 100 seconds. A look back at the first plot in this series clearly shows that lithium cells burn long and hot once ignited and all the ingredients to spread the fire to nearby materials are present. Once again, this data was collected for 18650-size cells, which are very small; anecdotal experience such as the vehicle fire mentioned earlier shows that a bank of prismatic LFP cells on fire is capable of producing much higher temperatures than recorded in the study. This information is sobering and some may decide to stay with lead-acid batteries and their drawbacks as a result: it is fine. There is irresponsible advice to be (easily) found, suggesting that building a lithium battery is just a matter of balancing a set of cells and throwing it into the boat after tweaking a few charging voltages. Those are the consequences that potentially come with such practices. At the end of their life, lithium battery cells eventually fail by running out of capacity. Chemical damage and plating of the electrodes inside the cell eventually consumes some of the lithium originally available for energy storage, consumes electrolyte and prevents the remaining lithium from migrating between the anode and cathode; the battery can no longer be charged or discharged enough to be usable and it must be discarded. Elevated temperatures, 40°C and over typically, greatly accelerate these adverse chemical reactions and shorten the life of the cells. In the case of installations on board marine vessels, strict care must be taken not to install them in hot environments such as engine compartments for this reason. While small cylindrical cells mostly used in portable devices usually fail relatively rapidly due to repeated heating during recharging and electric vehicle batteries in general can suffer from heating caused by intense discharge currents caused by accelerations, prismatic cells in more conservative applications such marine house banks have been exhibiting an increasingly phenomenal track record. The oldest ones in service may be around 7 or 8 years old now (2015) and no one has yet come up with a clear figure in terms of life expectancy. It is becoming increasingly clear that the 10-year mark will be reached and exceeded by some marine lithium house banks. Accelerated cycle testing is of no relevance in the context of marine house banks as it stresses the cells far beyond normal operation in this type of service and fails to model calendar ageing, in other words the passing of time. In a house bank application on a yacht, end-of-life will occur when there is either insufficient capacity left to cycle, or the discharge current capability is no longer sufficient to support high loads, like inverters. To my knowledge, no properly managed lithium house bank has yet reached a natural end of life. All those that were discarded or replaced failed due to external and completely avoidable events.